Glasgow coach Dave Rennie has committed himself to another year with the Warriors. The former Chiefs boss signed a two-year deal when he replaced Gregor Townsend in 2017 and Glasgow have now confirmed the New Zealander has signed a new one-year extension. 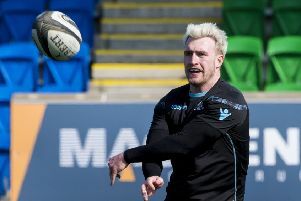 Rennie’s debut campaign in Glasgow saw his side fall at the Guinness Pro14 semi-finals, while they failed to make it out of their Champions Cup group. This year, however, Warriors remain on course for the Pro14 play-offs and were unlucky to be drawn against English powerhouse Saracens as they battled through to the last eight in Europe. Rennie, who is reportedly a contender to replace Michael Cheika as Australia coach after the Rugby World Cup, told the club’s website: “I’ve really enjoyed my first two years in Glasgow. It’s a different challenge for me and there are really good people at the club, so it was an easy decision to stay. “We’re going to have a lot of guys away at the Rugby World Cup and then our Scotland players will play in the Six Nations, so we won’t see a lot of those men, but we’ve got good depth and it’ll be a great opportunity for others during that period, so there is so reason why we can’t kick on. Scottish Rugby Chief Executive Mark Dodson added: “Dave is doing a great job in Glasgow and we’re delighted he is staying to continue building Glasgow Warriors into one of the top teams in Europe.